I am absolutely thrilled with the Everest left handed bread knife!! It cuts perfectly and so easily. 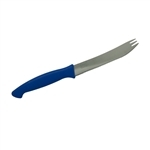 Have needed it for ages and will enjoy it for ages as it is a very good quality knife. The service was great, too. Will be buying more from lefty's as my wife is a lefty!